TEL-A High in hospitals | Technology Enabled Learning, Asbl. has merged with European Business University of Luxembourg, Asbl — We are moving to https://www.ebu.lu and close on March 29th 2019. Thank you for your continued support! Education is a fundamental right of all children including hospitalized children. As teachers, we should take responsibility to ensure that children have access to appropriate education, even while they are hospitalized. It seems that schooling hospitalized children is either taken for granted or forgotten, or a low priority in many parts of the country. The idea of letting the children catch up later seems to still prevail. This heightens the idea that being ill is a stalemate situation during which time normality drops by the wayside. Illness and hospitalization lead to loss of school days and education for some children. This issue has been addressed in published literature for more than three decades (1). Regular school attendance and swift school re-entry are considered to be important mechanisms for helping children cope with hospitalization and the management of their illness (2,3). Helping children stay connected with regular academic and social activities has been shown to reduce difficulties during school re-entry (4). Access to a teacher and being able to continue school within the hospital provides children with a sense of normalcy during the hospital stay. 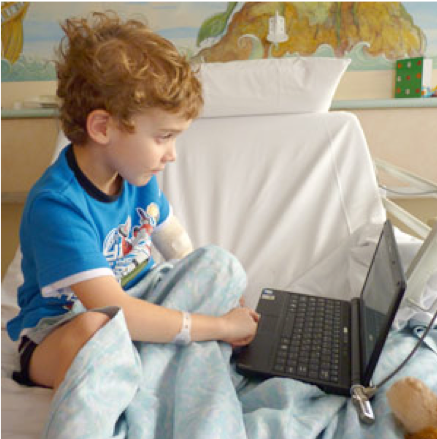 In an attempt to accommodate the educational needs of children and young people in hospitals, TEL-A and its army of experienced teachers provide online access to learning in a private or classroom environment for children who are hospitalized for extended periods. The involvement of a teacher in a patient’s total care enhances the student’s learning potential while ill, and facilitates a smoother return to school. Sometimes, the teacher’s responsibility may include course selection or rearranging timetables, work completion, test or examination proctoring. TEL-A places emphasis on the use of evolving new technologies and particularly games may even serve as a social companion for the child in this time of need, especially when there is no one else around, considering that play is vital in a child’s healing process. An online classroom environment can go a long way in restoring the norm. During long term hospitalization, children are susceptible to develop stress and anxiety caused by physical discomfort of the illness and treatments, as well as mental strains due to fear of medical procedures, separation, change of environment, confined space and restricted movements (Holden et al., 2002). Arroyos-Jurado E, Paulsen JS, Merrell KW, Lindgren SD, Max JE. Traumatic brain injury in school-age children academic and social outcome. J Sch Psychol. 2000;38:571–87. Fels DI, Shrimpton B, Robertson M. Kids in hospital, kids in school<http://www.ryerson.ca/pebbles/publications/KidsinHospitalKidsinSchool.pdf> (Version current at April 3, 2009). Fels DI, Samers PJ. Use of the asynchronous Black Berry technology in a large children’s hospital to connect sick kids to school<http://www.ryerson.ca/pebbles/publications/asynchronousblackberry.pdf> (Version current at April 3, 2009).